Noel Gallagher has revealed The Stone Roses are as excited by their new album as they were when they recorded their debut. 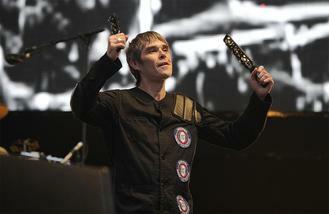 The 'Lock All The Doors' singer had an impromptu meeting with the band's frontman and his friend Ian Brown at a supermarket during which he told Noel how the recording sessions were going. The 'Fool's Gold' hitmaker shared to Noel that the atmosphere in the studio was comparable to when he, guitarist John Squire, bassist Gary 'Mani' Mounfield and drummer Alan 'Reni' Wren, made their self-titled 1989 LP - widely considered to be one of the greatest albums of all time. The former Oasis guitarist told NME: "I am very excited, for them mainly. They're going to play some new songs (live). I bumped into Ian in a supermarket recently. He was buying chocolate flavoured shower gel. This is not a joke. He leant in and said, 'Have you tried this?' And I said of course I hadn't. He swears by it, says it's amazing. And before it turned into a photo shoot with everyone and their cameraphones, he was telling me how excited they are by it all. He said it was like they were making their first record again." The Stone Roses have been working on their third studio LP for the past several months and have been working on the tracks at Paul Epworth's The Church Studios in north London. When previously asked how the album was coming along, Ian said "glorious" and promised it would be coming out "soon", potentially in time for the band's massive summer shows. The album will be the first new material from The Stone Roses for 22 years, since 1994's 'The Second Coming'. Fatboy Slim has teamed up with Idris Elba for a new track. Max George has enlisted the help of Jason Derulo to help launch his solo career. Katy Perry and Orlando Bloom enjoyed a weekend getaway to snowy Aspen as the couple's romance heats up. Sir Tom Jones was mourning the loss of his wife Linda on Sunday (10Apr16) following a battle with cancer. Meghan Trainor cried after she gave Jennifer Lopez one of her songs to record. Bryan Adams has cancelled a concert in Mississippi in protest of the state's 'Religious Liberty' bill. Lionel Richie is to be honoured at this year's Songwriters Hall of Fame Awards. NWA have been inducted into the Rock and Roll Hall of Fame in New York.